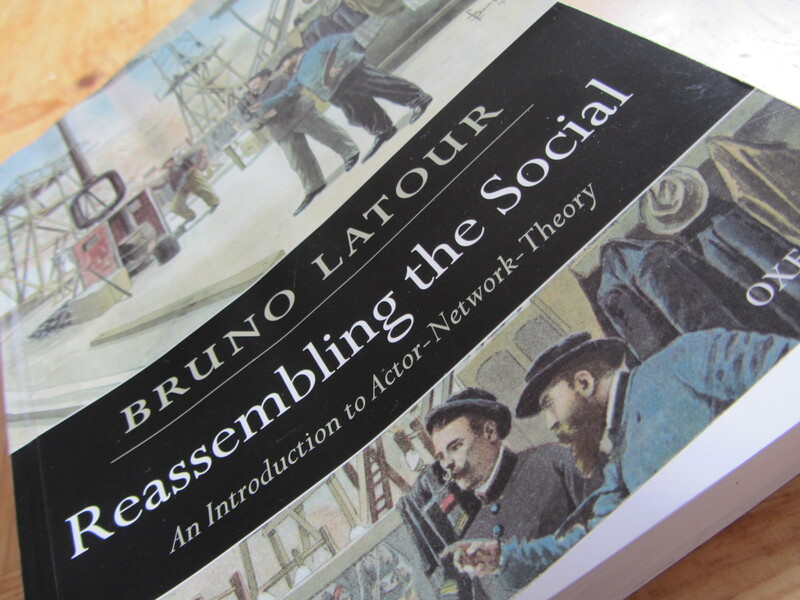 I finished reading Bruno Latour’s Reassembling the Social: An Introduction to Actor-Network Theory. I wish I could better assess this book’s importance. I read it fast because I think it’s a mess of a book, but there’s a lot of very good stuff in it. Latour’s point is to argue against the view among sociologists that “society” is some kind of pre-existing substance which can “explain” things or entities that are supposedly embedded in it (including religious beliefs, works of art, etc. etc.). For Latour, the “social” is more simply one type of association or connection between things that are not social (5). So-called “actor-network theory” is supposed to start with objects, entities without reducing them to some social function that would explain them. These entities and objects are said to move about in the world, associate and disassociate with each other, and, in doing so, (re)assemble the social (235-40). According to Latour, “religion” is a type of connector that links entities that are not-social (7). This I think is pretty good. I would, however, also recommend transposing the definition of society (from p.5, cited above) onto religion. (the social is “one type of association or connection between things that are not social”). Religious, then would be a type of connection between things that are not religious. You could do the same with Jewish –Judaism is a type of connection between things that are not Jewish. Or ethical –the ethical is a type of connection between things that are not ethical. For Latour, religion, science, politics, law, and art are different kinds of connectors that connect entities and objects, often the same entities and objects, in different ways (239). This may be a vague formulation, but I think it holds a lot of promise. This entry was posted in uncategorized and tagged religion, what i'm reading. Bookmark the permalink.